An artist well known for his portraits of twentieth-century influential figures, Samuel Johnson Woolf spent four months in France during World War I with the American Expeditionary Forces (AEF). 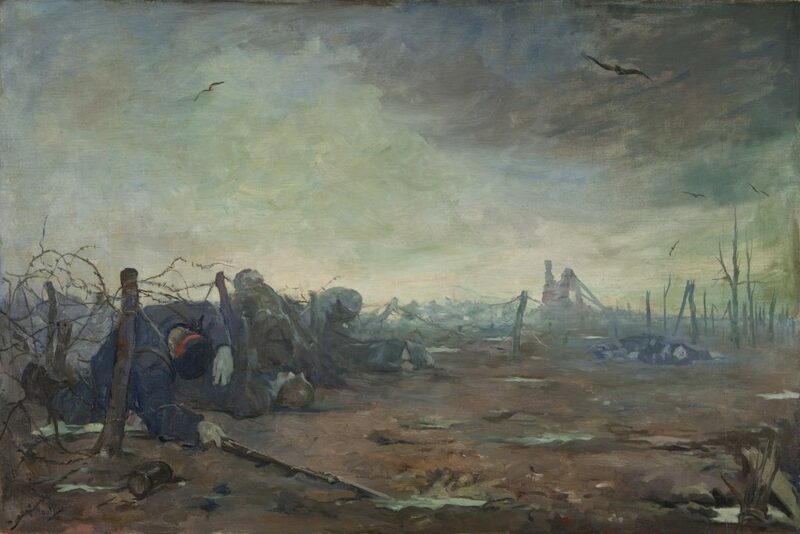 As an artist-correspondent for Collier’s Weekly, Woolf was embedded in the trenches along the front and behind the lines. Immediately upon returning to New York from the war, Woolf took sketches from his eyewitness point-of-view and began a series of sober, humanistic paintings drawn from his experiences. Born in 1880 into an active arts family, Woolf’s vantage point for sketching the war was anything but safe and calm. 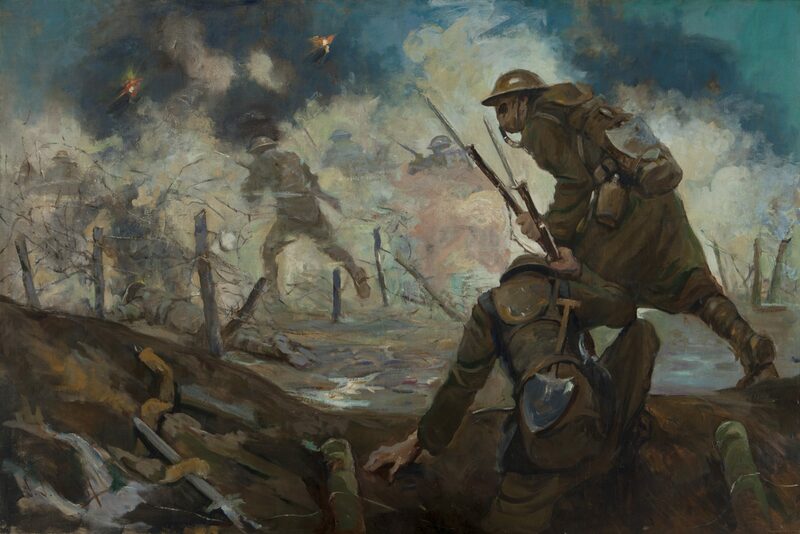 It is his loose brushstrokes that translate into a sense of urgency and immediacy, echoing the events he witnessed, and presenting a gritty, realistic portrayal of life in the trenches. The grit, blood and bleakness of what he witnessed is not exaggerated in his paintings; if anything, some of his works, including Carry On, downplay moments of chaos and heroism. His paintings do not shy away from presenting the viewer with graphic details in painful situations, as in First Aid Station at Seicheprey. According to a 7 July 1918 New York Times article about Woolf’s time in France, Woolf said he did not create work his first few days in the trenches, stating, “You may ‘go in’ thinking you will set to work at once, but so full of strange emotions does your life become that painting is out of the question.” Woolf did not limit himself to producing art as he assisted with the wounded, drove an ambulance, pitched in with cooking when the cook was gassed, and even attempted to rescue some paintings from a local church before it was shelled. 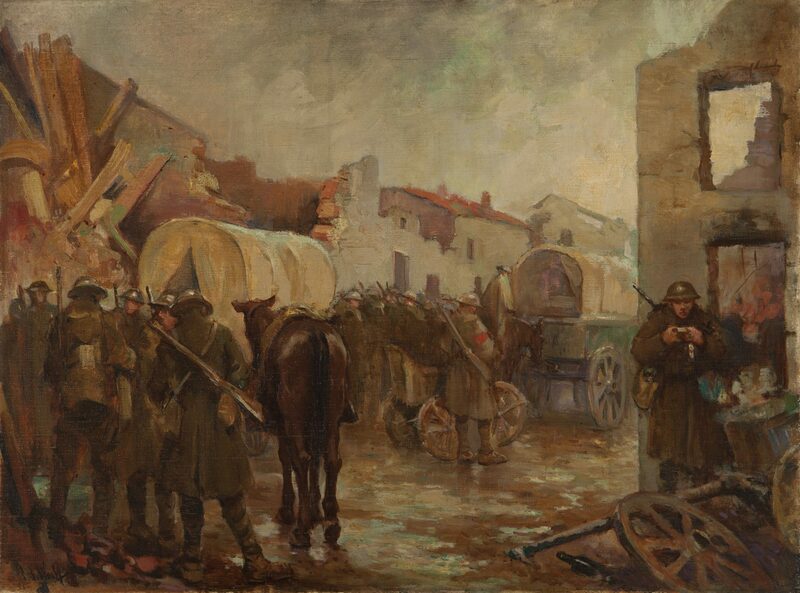 While an artist by profession, his immersion with the AEF in France and in the war render his paintings as a record of combat that is raw and unvarnished. 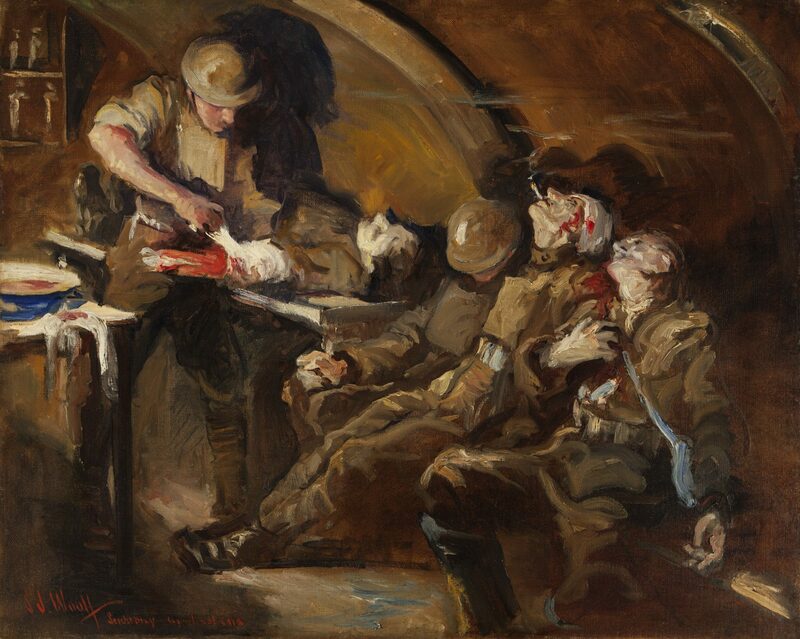 Twenty-three of Woolf’s War War I paintings are now part of the Army Art Collection housed at the U.S. Army Center of Military History’s Museum Support Center at Fort Belvoir, Virginia. A recent and important acquisition to the collection, curator Sarah Forgey said that these paintings fill a gap in the Army’s pictorial record, as the Army Art Collection contains very few eyewitness pieces from World War I.
Woolf gained acclaim as a war artist when his paintings were exhibited at the Milch Galleries in New York City and the Memorial Art Gallery in Rochester following his return from France. He served again as an artist-correspondent during World War II and died in 1948.